I'm a big fan of hues of blues being worn together and here is a great example of that. This beautiful silk blouse rocks because of its tie dye print and looks amazing with a pair of jeans. This colour combination really makes this look clean and fresh, perfect for spring! I love polka dots! This skirt is so cute and girly I love it!! The front is clean with two pleats and the back has a super fun little ruffle along the waistband. This skirt can be worn to work, a stroll in the park to drinks on the patio with your lady friends, it's so versatile! 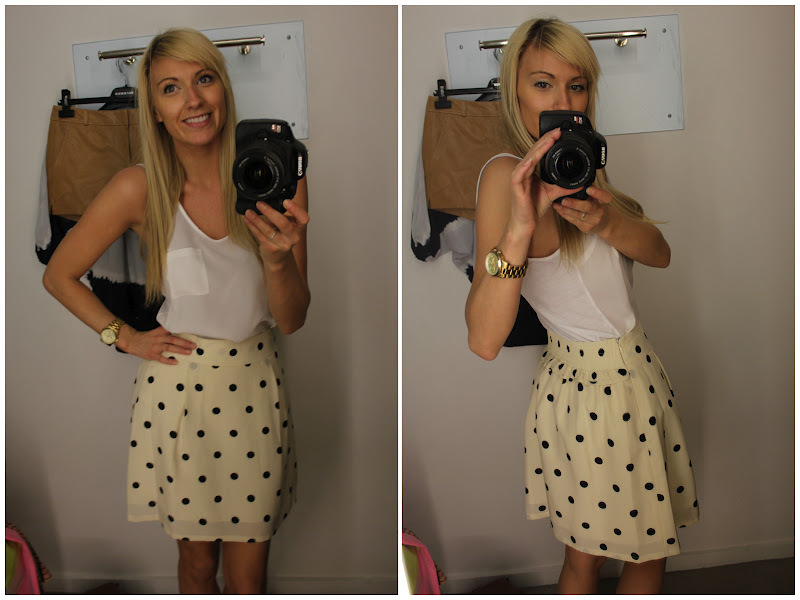 This skirt makes me wish I was back in Barcelona wearing it! It's got such a funky print and actually has a lot more colours in it then you can see. With such a statement piece like this one I would wear a basic top and a really fun pair of earrings! I'm so in love with this dress! It's got a nice subtle rope print with a great combo of a soft peachy colour and navy. This dress can take you from your workplace to being a guest at someones summer wedding! Who loves fluorescent colours? I DO! If you haven't tried on a pair of Rag & Bone leggings YOU NEED TO! They are the softest things in the world. So much, I bet people have slept in them! And who doesn't want a pair of hot pink pants to spice an outfit up?! Again, I DO! With fun pants like these I couldn't stop there I had to pair it with this awesome fluorescent green sweater. For a morning that I'm waking up with a giant smile on my face THIS is the outfit I would grab to wear to keep that energy high all day!